Mr X, if you continue to act this way to other members and the staff of NYF, I will be forced to suspend you. this is your first and only warning. we wont stand for any of this negativity & insults here. I didn't bother to read his last reply ... I couldn't care less what it stated. Beatmatching is one of the most important things a dj must learn when it comes to mixing dance music. You must also learn each and every one of your tracks and learn the breaks and how to time them so that the transition is smooth. For me the #1 rule of deejaying is knowing your records. You never want to suddenly end one song and go right into the next. I suggest buying yourself a used pair of 1200's and learning the old fashioned way, it will make you a better dj.. Good luck, its awesome that your into it whether its cd's or lp's. As long as you do it for the love, there is no greater rush than having a couple of hundred people dancing to your finger tips, then coming up to you later and thanking you for giving them a wonderful night and bringing back memories...old school is where its at, it will always sell and it will never die. Last edited by DJ Coast; May 6th, 2008 at 02:09 AM. Personally, I think DJing is the weakest talent there is. Those who can't act, sing, dance, or even talk professionally, go the route of DJing. 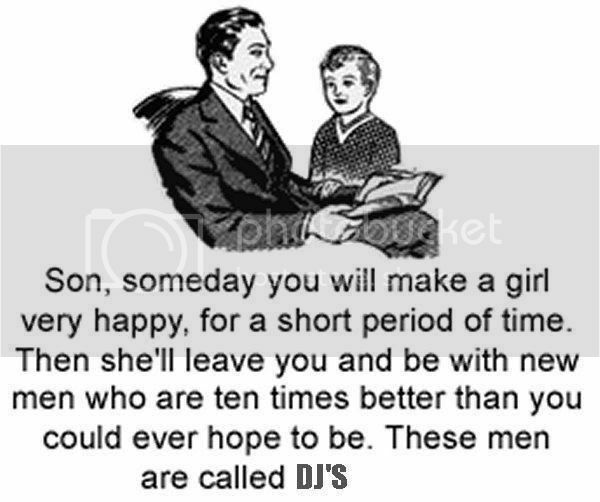 I don't understand why people who "DJ" think of it as so professional and spritual, as if there is a essence behind it. I also don't see the big deal about people who use CD mixing equipment? Half the time people could care less what creativity you put in a mix, as long as the flow of the music is still there. Furthermore, the whole BPMs method is stupid, as if that's the only way to jump from one song to another. Personally, I think having a good music selection is ten times more important than anything else. I got a huge freestyle collection consisting of almost 3000 songs. I could of always been a DJ myself, but I rather have people take me seriously. I wanted to add, yesterday i was listening to one of my first mix tapes before I could beatmatch... . What I did is for a whole week after many hours of studying the tracks on the set I would memorize the breaks and certain spaces in songs, I would then time the next song and the transition would be pretty good. I then learned how to beatmatch and let me tell you it is whole lot more fun and it sounds so much better once you get it down. I also spin progressive house and I used to spin trance, blending records together for a few minutes, its the only way to go. For weddings and them kind of gigs, it may not matter, but if you have the dancefloor packed playing dance music, you don't want to loose the crowd, my #1 goal was to keep everyone moving. If I saw a few people start to leave the floor, I would break out a big track to keep them going. The biggest compliment to a dj is when the whole place is moving....djc. popularity, fame and money does not make u a good dj. And for the record, u can mix oldies, rock and disco quite well. Its actually harder to mix than house, hiphop, etc because the old joints were not computer generated but created by live bands that tend to sway in pitch. Bottom line, if you cared enough to ask, you should take what everyone says here seriously. Seems like most people are not trying to bash you (as you asked politely) but rather shed some light on subject. It is a lil crazy to hear you don't even have an idea of what we are talking bout tho. Do yourself a favor... Do some research online. Look into dj instructional programs at various schools / institutions across the country. Or just do it like most of us did --- find someone who you know willing to show you the ropes and spend a lot of time in the lab perfecting your craft. Regardless of the amount of volume you make as a mobile dj, learning how to dj as opposed to being a human jukebox will greatly increase your biz, as well as give you a whole new perspective on music and life... Trust, this is not a dis, but hey you asked in the first place. It is very easy to mix 50,60's and 70's rock and the light..just need to understand how music works. Besides most of the tracks in those years have cold endings, and are therefore not meant to be "mixed" for argument sake. BUT the real definition of BPM is really simple, it is the tempo of a particular piece of music..simple as that, any musician will know that but I guess not every DJ. No big deal..life is good.